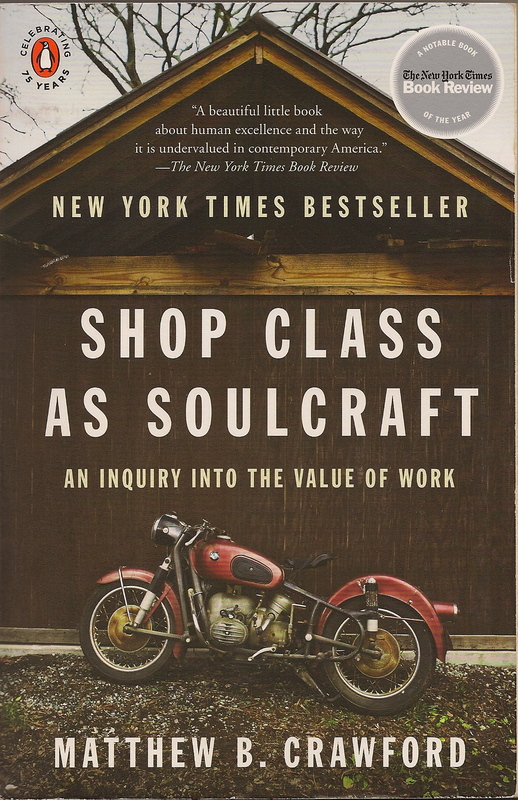 On our road trip earlier this autumn, H. and I read – aloud – Shop Class as Soulcraft: An Inquiry into the Value of Work by Matthew Crawford . (It was the first book in this season’s Take and Read.) We both enjoyed it. Crawford is a philosopher and a mechanic with a Ph.D. who left a job at a think tank to open a motorcycle repair shop. In this book, he reflects on working with one’s hands, on the nature of knowledge, on human agency and self-reliance, on our relationship with material things. Essentially, he wants to rehabilitate manual work, to “give due credit to the cognitive richness of the skilled trades.” He quotes Anaxagoras: “It is by having hands that man is the most intelligent of animals.” Crawford’s not about making hand-work “precious” in some craftsy way, though, but about considering the rich ways in which we learn and know, about historical changes in work and what’s valued in work, and about ethical considerations in labouring. H. is a drywall contractor who knows first-hand the shifts away from “shop class” Crawford is talking about, and the growing difficulty of finding workers in his trade (and the construction trades generally) who are interested in making a solid career of it. (And, says Crawford, a good career can be made of it.) H. also likes motorcycles (a lot) and I’m afraid he completely understood all those chapters about the education of a gearhead and Crawford’s involvement with a clutch road oil seal, which I floated through without comprehension, just taking his word for it! When I returned to the workplace after a couple of decades away, I certainly noticed this shift, though it’s Crawford who gives me words for it. I found emphasis on team spirit, buying into institutional mission, what kind of personality I am and how that relates to personalities around me. How, that is, I was doing as a person (or team player). Less ongoing attention was paid, in an external and formal way in the workplace structures at least, to my competencies as an editor or to the work I was producing. These statements are not meant to cast that particular workplace (a church institution) in a negative light, but to affirm anecdotally that the shift Crawford documents is everywhere. It’s also fair to note that since reading Crawford’s critique of the ubiquitous new paradigm, I’ve found myself wondering how it’s affected, for good or bad, the ethos of the denomination in which I worked. All of which to say that this is a book worth reading and thinking about further. This entry was posted in Books, Contemporary life and tagged management as coaching, Matthew Crawford, Shop Class as Soulcraft, Take and Read, work by doradueck. Bookmark the permalink. I actually like the new “therapeutic” approach to management. It can be done very well, I think. But I would love to read Matthew Crawford’s critique. And, of course, I thought of Pirzig’s Zen and the Art of Motorcycle Maintenance when I read your interesting post. Thanks so much, Shirley. We enjoyed listening to Mike Rose; a very interesting link and I see Matthew Crawford is featured there too, not on the audio, but in one of the segments on that page. I appreciate the way Mr. Rose works at the “unresolved tensions” between book learning and practical learning, trying to blend hands-on experience and formal training. Good to see the Fetzer Institute’s involvement too! — Pirzig’s book was suggested to us as complementary reading for our “Take and Read” session, but I’m afraid I didn’t get to it, nor had I read it earlier. — You’ve been in leadership a long time and have probably seen the shifts of which Crawford speaks, and it’s good to hear your positive assessment of it. The emphasis on the whole person is compatible with so many values we hold. I suspect you also do this kind of leadership/management very well! — Crawford addresses the corporate office setting, exaggerated yet also revealed in Dilbert cartoons and “The Office,” though I extrapolated to my own work experience in a non-commercial setting. I do agree with him that if the office has become “a place of moral education, where souls are formed and a particular ideal of what it means to be a good person is urged upon us,” (opening the way for “work to become a rather moralistic place”) we ought to assess exactly what ideal of a “good person” is being promoted. He suggests it’s a readiness for teamwork, and teamwork he says, “depends on group dynamics, which are inherently unstable and subject to manipulation.” The reason he contrasts office culture and the manual trades belongs to the larger project of his book, and here to “the idea of individual responsibility, tied to the presence or absence of objective standards. [ital. his].” He’s provocative, that’s for sure.